Apartment 3 incl. / 4 max. Apartment 2 incl. / 3 max. Apartment 6 incl. / 7 max. Cottage 8 incl. / 8 max. Bedroom 2 incl. / 2 max. Canvas bungalow 4 incl. / 6 max. Not clean, oven didn’t work, andno scissors or wine glasses. Work needs to be done in pool complex 're flooring .uneven, moving tiles . Steps to new slide very slippery need to have a grip finish applied . The children loved the slides, the pools and the game facilities (football pitch, play park etc) The animation team were very good, especially Fabio who always had a smile for everyone and organised the daily events very well. We enjoyed our stay. Floor plan on the website slightly misleading as to the size of the kitchen/living area. A few more kitchen utensils would have been nice, e.g. some tongs to use for the BBQ and better knives for cutting meat and veg (serrated knives not easy to use). Fine for family of 4, 7 would struggle. Complained about our pitch, staff werent interested in helping. Found out that the pitch we were allocated wasnt ours. Ours had been given to another family who conplained about that same pitch a day before we arrived and were then given our pitch! Pitch was too small for the size of our caravan and awning, paid for a grand comfort pitch and couldn't reach the drainage, water. Too shaded. too noisy at night. shop could be bigger/better stocked. Just the right size for a family of four. No oven, but that is a minor thing. Great pool complex and fantastic weather, Lots of shade so didn't get too hot. Great pitch, overlooking the lake, Full length decking with lounge and dining areas was great. Perigord area. Overall quality of campsite. Location of the Madras mobile near to the lake. Wide spaces between mobiles. Size and cleanliness of the mobile. Helpfulness of staff. Peaceful setting. Size and practicality. Layout. Equipment. General condition of everything. Space around the mobile - i. e. mobiles not tightly packed together. Beautiful location overlooking the lake. The swimming pool area was good. The security staff attitude was a disgrace when we arrived 5 mins late in the evening. I was quite shocked. The pitches were crammed in like sardines, camping was like a shantytown. The quality and variety of food in cafe was limited. Very often the toilet block has no soap. Fortunately we were on woodland edge which meant one side felt open. Very cramped and no grass, we walked straight on to dirt each day. The pitches have no time to recover. We would have complained if we had been inside the main woodland. Location and local town were very good. Food and drinks in Bugue very good if you hunted places out. Our 11 Year old liked the idea and concept of the water park. Great location to visit the west of Dordogne (visit Peregueux). OK site but too active for us. It is a very active and therefore noisy site but quietens down after 11.30pm. Pitch was way too small in our case even though we forewarned at booking of the size of the caravan. With so many people to cater for and so many young families, the food, bar and entertainment area was too mass-market (Butlins) for us. The water park although awesome in concept was avoided by our both us and our 11 year old and his friends because the water was breathtakingly cold. Forget getting a sunbed too unless you are an early holiday riser; there were enough spare beds on the adjacent field which worked. Bathroom door came off it's runner and wasn't fixed by the time we left, despite man having a look at it. Barbecue was on it's last legs but still managed to cook on it 4 times. Spacious pitch, great scenery, great staff, superb facilities, great functions, a wonderful place. Occasionally noisy guests late at night walking home from late functions and neighbours not respecting a suitable time to be quieter. Not really anything the site can do about these but signs asking for quiet after 11pm would help. Tree cover, spacious area, great views. Wonderful apartment in the wooded area. Fantastic water park where many hours of fun were had by our daughters and their cousins who were also staying on the site. Very friendly and helpful staff in all areas.of the site. Beautiful location. The music some evenings was too loud and very repetitive, which at times became annoying. Very bright and spacious, ideal for our family. The pitch that was given was on a slope and not really safe for children . We did ask for another pitch but was told everything was booked . Yet the pitch next to us was vacant the whole time we were there . Shame as that made a real impact on us enjoying our stay and actually left 2 days early . we have used castels before at other sites and always been impressed with the pitch given . Accommodation was excellent. Everything was clean and well organised. Nice big fridge and plenty of freezer space. I tried to find out before I went if there was a BBQ there, couldn't find out. There is. My son didnt get picked to do the water polo and was really sad. Needs more workspace in kitchen eg a side bench. Needs a drainer for dishes. Safety of the pool area. One slide dangerous for young children. Water tap difficult to use. 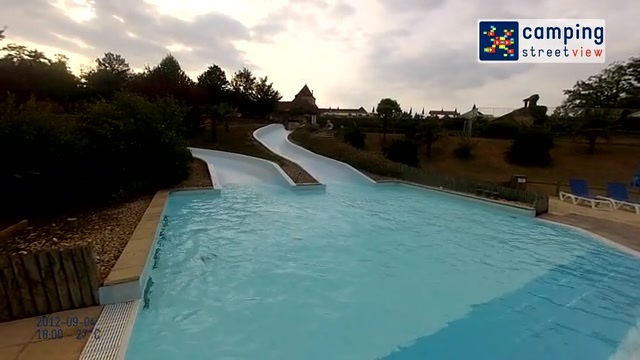 Great site, loved the pools, all staff were very friendly and helpful, great base for exploring this area of the Dordogne. The booking fee of €30 for the reservation. More and more sites are doing this. Surely it can be done for a nominal fee of say €5. If I had just turned up this would not have been charged. Great pitch as always with Castels. Shade and sun. Pitches not as private as other Castels and more noisy. The pool facilities for the children are excellent. The safari tent was good fun and well equipped. Excellent coffee. The reception staff seemed like they had finished their season and were simply hanging on for the last few days; not really wanting to help. Well equipped safari tent, great fun for the kids, but it was freezing at night. We stayed the second half of the week in an apartment which had no seating area/family area/living room. Just had beds ... even in the kitchen. We love the swimming pools and the pitch size is good. The entertainment is quite good and the food offered is also good. Good sized well kept pitch with electric and water connections close by. Drainage was uphill so unuseable but we just let the waste water soak away under the caravan. Pools were fantastic. Very child friendly site. Excellent pool facilities and accommodation. Lovely big site with plenty of places to walk the dog. The entertainment and noise after it finished was very loud. We were in D3 which was great for being so close to the pool but probably the residence that gets the most noise. Close to the pool, clean and a great patio with table and chairs. Very noisy in the evening, I think any other residence except D3 is probably significantly quieter. Erg vieze camping: Stinkend smerig sanitair, vies zwembad (voetenbaden e.d. ), beschimmeld groente & fruit in supermarkt. The pool complex is interesting And varied. The region and area has loads to do. The accommodation was top notch and beautifully maintained. It was a highlight of the stay. The pool area whilst lovely was really unclean. The stairs between the upper and lower regions are poorly designed, however they are also in desperate need of water blasting. It was frustrating to see cleaners but not have this done in the 7days we were there. No air con or fans. A spatula for flipping pancakes and tongs for the BBQ. Pools were fantastic. Bar are and play area also good. Well layed out. Comfortable and clean. We tend to use Camping Castel sites as love the vibe and layouts of their campsites. This one did not disappoint. Great accommodation, and superb pool complex, and the reception desk when we needed them to help with a fault on our car went out of their way to help us. Can't ask for more. Good size, great shade, and decent privacy. Although a lively site, it went quieter later. We were quite relaxed. The only thing was access to pitch on arrival (C1). There is a light post right in the middle of the access route (next door had parked right up on the little access road - so we had to reverse van through the small gap). We did it with little fuss, but it did cause a little stress after a long drive (soon forgotten, with the first bottle of wine). Very relaxed lifeguarding around very busy pool. Seemed more interested in people moving sun beds which are limited and although not supposed to be reserved guests seem to get away with reserving beds for sometimes a couple of hours whilst not being on pool complex . Pizza kiosk was swarming in flys and food not covered. Was not obvious where the Electricity supply was on our pitch. Eventually found between a number of cabins (Cabins probably added on previous tent pitches). No air conditioning and had to wedge the windows open as the hinges were not stiff enough to keep them open. No wine glasses!! Loved the pools, activities like the trampoline and quad bikes. Oscar who worked on them was fabulous with the kids. Food was poor enough. The restaurant menu was limited, it would be nice to have a nicer restaurant. The take away and bar food was fine but the restaurant was limited. a little small for 5 of us.